There are many concerns for any bathroom renovation project, such as the color of paint to use, the type of flooring to put in, or even cabinet handle styles. All of these decisions hinge solely on personal preference; however, the matter of bathroom lighting encompasses many more considerations or issues that may come up. Taste is just one of these. A few more extremely important thing to consider when altering or putting in bathroom lights is how well the lights will illuminate what needs to be illuminated, and how much reconstruction is involved in installing these lights. Contemporary light fixtures, such as sleek vanities or even fluorescent lights, appeal to many persons’ sense of style. 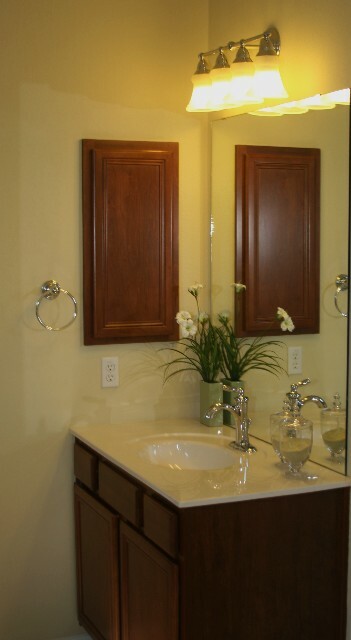 Usually a three-light vanity above the mirror or two wall-mount sconces on either side of the mirror are the most flattering lighting choices, because both of these illuminate the face without creating dark shadows under the chin or around the eyes. However, there are other options for a modern look that flatters the face. Round fluorescents are becoming more popular and while it may sound like the light could be rather harsh, when placed at strategic distances from the mirror, fluorescent lights can be even more desirable than traditional bulb options. Track lighting fixtures are a perfect alternative for those who want easily installed lights. Unlike many forms of lighting, track lights do not require that the wall be torn out or ceiling be pulled halfway down to install. Usually the exposed wiring is run along the edge of the ceiling or floor, and can be either plugged in to a socket or wired into a pre-existing circuit. The lights themselves are mounted on a strip that contains the electrical information, and can often be turned to shine in any direction the user desires. Track lights have different voltage systems so it is imperative to know the bulb wattage allowed in any given light before purchasing. While the modern look may work for many lighting aspirants, some people prefer a more classic look. Ceiling lights are an answer to the more Renaissance designers. Although ceiling fixtures are often too large for most people, a spacious bathroom can easily make use of a small hanging light or an artfully decorated bulb. The main concern of ceiling lights is that they often do not properly light the face when in front of a mirror, so small vanity lights or an LED strip on both sides of the mirror may be needed as a compliment. A local Lowe’s, Home Depot, or other lighting outfit will offer the most ideas; seeing various designs and types of fixtures is the best way to visualize an inspiration for any home project. These are the most common bathroom lighting ideas, but a bathroom does not have to be limited to them. Anything from standing lamps to free bulbs can be used. The most important thing is safety, and beyond that, it is entirely up to the designer to decide what looks good.